Original British film poster for The Lavender Hill Mob. This is one of the most loved Ealing comedies, starring Alec Guinness and Stanley Holloway. The film tells the story how a gentle bank clerk hatches a plot to melt down bullion and smuggle it out the country as miniature Eiffel Towers. The poster was designed by S. John Woods (1915-1997) and the artwork was done by Ronald William Searle (1920-2011). This poster is conservation linen backed and unfolded and would be shipped rolled in a strong tube. 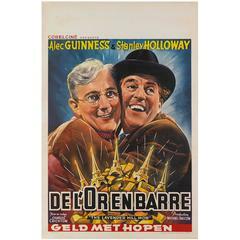 Original Belgian movie poster for the 1951 Ealing Comedy staring Alec Guinness, Stanley. Holloway, Sidney James. Signed vintage Peter Max "The Grammy Poster" in a glossy red wooden frame Inside measurements 18 x 24 inches.